Joining me today is an entrepreneur from Pakistan. I want more international founders so I’m excited to talk to him. He recognized that companies needed more developers. Well, he had access to talented developers in Pakistan so he created a company focused on Social zoos. But all at once, social went away and the company took a big hit. I want to find out how he turned the business around when it dried up seemingly overnight. 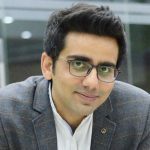 Salman Lakhani is the co-founder of Cubix, a digital products and mobile app development company.